This article is about the American scientist. For the American illustrator, see Barbara McClintock (illustrator). 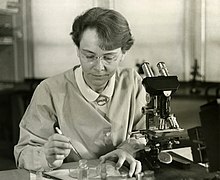 Barbara McClintock was born Eleanor McClintock on June 16, 1902 in Hartford, Connecticut, the third of four children born to homeopathic physician Thomas Henry McClintock and Sara Handy McClintock. Thomas McClintock was the child of British immigrants; Sara Ryder Handy was descended from an old American Mayflower family. Marjorie, the oldest child, was born in October 1898; Mignon, the second daughter, was born in November 1900. The youngest, Malcolm Rider (called Tom), was born 18 months after Barbara. As a young girl, her parents determined that Eleanor, a "feminine" and "delicate" name, was not appropriate for her, and chose Barbara instead. McClintock was an independent child beginning at a very young age, a trait she later identified as her "capacity to be alone". From the age of three until she began school, McClintock lived with an aunt and uncle in Brooklyn, New York in order to reduce the financial burden on her parents while her father established his medical practice. She was described as a solitary and independent child. She was close to her father, but had a difficult relationship with her mother, tension that began when she was young. The McClintock family moved to Brooklyn in 1908 and McClintock completed her secondary education there at Erasmus Hall High School; she graduated early in 1919. She discovered her love of science and reaffirmed her solitary personality during high school. She wanted to continue her studies at Cornell University's College of Agriculture. Her mother resisted sending McClintock to college, for fear that she would be unmarriageable. McClintock was almost prevented from starting college, but her father intervened just before registration began, and she matriculated at Cornell in 1919. McClintock began her studies at Cornell's College of Agriculture in 1919. There, she participated in student government and was invited to join a sorority, though she soon realized that she preferred not to join formal organizations. Instead, McClintock took up music, specifically jazz. She studied botany, receiving a BSc in 1923. Her interest in genetics began when she took her first course in that field in 1921. The course was based on a similar one offered at Harvard University, and was taught by C. B. Hutchison, a plant breeder and geneticist. Hutchison was impressed by McClintock's interest, and telephoned to invite her to participate in the graduate genetics course at Cornell in 1922. McClintock pointed to Hutchison's invitation as the reason she continued in genetics: "Obviously, this telephone call cast the die for my future. I remained with genetics thereafter." Although it has been reported that women could not major in genetics at Cornell, and therefore her MS and PhD—earned in 1925 and 1927, respectively—were officially awarded in botany, recent research has revealed that women did earn graduate degrees in Cornell's Plant Breeding Department during the time that McClintock was a student at Cornell. During her graduate studies and postgraduate appointment as a botany instructor, McClintock was instrumental in assembling a group that studied the new field of cytogenetics in maize. This group brought together plant breeders and cytologists, and included Marcus Rhoades, future Nobel laureate George Beadle, and Harriet Creighton. Rollins A. Emerson, head of the Plant Breeding Department, supported these efforts, although he was not a cytologist himself. McClintock's cytogenetic research focused on developing ways to visualize and characterize maize chromosomes. This particular part of her work influenced a generation of students, as it was included in most textbooks. She also developed a technique using carmine staining to visualize maize chromosomes, and showed for the first time the morphology of the 10 maize chromosomes. This discovery was made because she observed cells from the microspore as opposed to the root tip. By studying the morphology of the chromosomes, McClintock was able to link specific chromosome groups of traits that were inherited together. Marcus Rhoades noted that McClintock's 1929 Genetics paper on the characterization of triploid maize chromosomes triggered scientific interest in maize cytogenetics, and attributed to her 10 of the 17 significant advances in the field that were made by Cornell scientists between 1929 and 1935. McClintock's breakthrough publications, and support from her colleagues, led to her being awarded several postdoctoral fellowships from the National Research Council. This funding allowed her to continue to study genetics at Cornell, the University of Missouri, and the California Institute of Technology, where she worked with E. G. Anderson. During the summers of 1931 and 1932, she worked at Missouri with geneticist Lewis Stadler, who introduced her to the use of X-rays as a mutagen. Exposure to X-rays can increase the rate of mutation above the natural background level, making it a powerful research tool for genetics. Through her work with X-ray-mutagenized maize, she identified ring chromosomes, which form when the ends of a single chromosome fuse together after radiation damage. From this evidence, McClintock hypothesized that there must be a structure on the chromosome tip that would normally ensure stability. She showed that the loss of ring-chromosomes at meiosis caused variegation in maize foliage in generations subsequent to irradiation resulting from chromosomal deletion. During this period, she demonstrated the presence of the nucleolus organizer region on a region on maize chromosome 6, which is required for the assembly of the nucleolus. In 1933, she established that cells can be damaged when nonhomologous recombination occurs. During this same period, McClintock hypothesized that the tips of chromosomes are protected by telomeres. McClintock received a fellowship from the Guggenheim Foundation that made possible six months of training in Germany during 1933 and 1934. She had planned to work with Curt Stern, who had demonstrated crossing-over in Drosophila just weeks after McClintock and Creighton had done so; however, Stern emigrated to the United States. Instead, she worked with geneticist Richard B. Goldschmidt, who was the head of the Kaiser Wilhelm Institute. She left Germany early amidst mounting political tension in Europe, and returned to Cornell, remaining there until 1936, when she accepted an Assistant Professorship offered to her by Lewis Stadler in the Department of Botany at the University of Missouri-Columbia. While still at Cornell, she was supported by a two-year Rockefeller Foundation grant obtained for her through Emerson's efforts. During her time at Missouri, McClintock expanded her research on the effect of X-rays on maize cytogenetics. McClintock observed the breakage and fusion of chromosomes in irradiated maize cells. She was also able to show that, in some plants, spontaneous chromosome breakage occurred in the cells of the endosperm. Over the course of mitosis, she observed that the ends of broken chromatids were rejoined after the chromosome replication. In the anaphase of mitosis, the broken chromosomes formed a chromatid bridge, which was broken when the chromatids moved towards the cell poles. The broken ends were rejoined in the interphase of the next mitosis, and the cycle was repeated, causing massive mutation, which she could detect as variegation in the endosperm. This breakage–rejoining–bridge cycle was a key cytogenetic discovery for several reasons. First, it showed that the rejoining of chromosomes was not a random event, and second, it demonstrated a source of large-scale mutation. For this reason, it remains an area of interest in cancer research today. Although her research was progressing at Missouri, McClintock was not satisfied with her position at the University. She recalled being excluded from faculty meetings, and was not made aware of positions available at other institutions. In 1940, she wrote to Charles Burnham, "I have decided that I must look for another job. As far as I can make out, there is nothing more for me here. I am an assistant professor at $3,000 and I feel sure that that is the limit for me." Initially, McClintock's position was created especially for her by Stadler, and might have depended on his presence at the university. McClintock believed she would not gain tenure at Missouri, even though according to some accounts, she knew she would be offered a promotion from Missouri in the spring of 1942. Recent evidence reveals that McClintock more likely decided to leave Missouri because she had lost trust in her employer and in the University administration, after discovering that her job would be in jeopardy if Stadler were to leave for Caltech, as he had considered doing. The university's retaliation against Stadler amplified her sentiments. In early 1941, she took a leave of absence from Missouri in hopes of finding a position elsewhere. She accepted a visiting Professorship at Columbia University, where her former Cornell colleague Marcus Rhoades was a professor. Rhoades also offered to share his research field at Cold Spring Harbor on Long Island. In December 1941, she was offered a research position by Milislav Demerec, the newly appointed acting director of the Carnegie Institution of Washington's Department of Genetics Cold Spring Harbor Laboratory; McClintock accepted his invitation despite her qualms and became a permanent member of the faculty. After her year-long temporary appointment, McClintock accepted a full-time research position at Cold Spring Harbor Laboratory. There, she was highly productive and continued her work with the breakage-fusion-bridge cycle, using it to substitute for X-rays as a tool for mapping new genes. In 1944, in recognition of her prominence in the field of genetics during this period, McClintock was elected to the National Academy of Sciences—only the third woman to be elected. The following year she became the first female president of the Genetics Society of America; she was elected its vice-president in 1939. In 1944 she undertook a cytogenetic analysis of Neurospora crassa at the suggestion of George Beadle, who used the fungus to demonstrate the one gene–one enzyme relationship. He invited her to Stanford to undertake the study. She successfully described the number of chromosomes, or karyotype, of N. crassa and described the entire life cycle of the species. Beadle said "Barbara, in two months at Stanford, did more to clean up the cytology of Neurospora than all other cytological geneticists had done in all previous time on all forms of mold." N. crassa has since become a model species for classical genetic analysis. In the summer of 1944 at Cold Spring Harbor Laboratory, McClintock began systematic studies on the mechanisms of the mosaic color patterns of maize seed and the unstable inheritance of this mosaicism. She identified two new dominant and interacting genetic loci that she named Dissociation (Ds) and Activator (Ac). She found that the Dissociation did not just dissociate or cause the chromosome to break, it also had a variety of effects on neighboring genes when the Activator was also present, which included making certain stable mutations unstable. In early 1948, she made the surprising discovery that both Dissociation and Activator could transpose, or change position, on the chromosome. Between 1948 and 1950, she developed a theory by which these mobile elements regulated the genes by inhibiting or modulating their action. She referred to Dissociation and Activator as "controlling units"—later, as "controlling elements"—to distinguish them from genes. She hypothesized that gene regulation could explain how complex multicellular organisms made of cells with identical genomes have cells of different function. McClintock's discovery challenged the concept of the genome as a static set of instructions passed between generations. In 1950, she reported her work on Ac/Ds and her ideas about gene regulation in a paper entitled "The origin and behavior of mutable loci in maize" published in the journal Proceedings of the National Academy of Sciences. In summer 1951, she reported her work on the origin and behavior of mutable loci in maize at the annual symposium at Cold Spring Harbor Laboratory, presenting a paper of the same name. The paper delved into the instability caused by Ds and Ac or just Ac in four genes, along with the tendency of those genes to unpredictably revert to the wild phenotype. She also identified "families" of transposons, which did not interact with one another. Her work on controlling elements and gene regulation was conceptually difficult and was not immediately understood or accepted by her contemporaries; she described the reception of her research as "puzzlement, even hostility". Nevertheless, McClintock continued to develop her ideas on controlling elements. She published a paper in Genetics in 1953, where she presented all her statistical data, and undertook lecture tours to universities throughout the 1950s to speak about her work. She continued to investigate the problem and identified a new element that she called Suppressor-mutator (Spm), which, although similar to Ac/Ds, acts in a more complex manner. Like Ac/Ds, some versions could transpose on their own and some could not; unlike Ac/Ds, when present, it fully suppressed the expression of mutant genes when they normally would not be entirely suppressed. Based on the reactions of other scientists to her work, McClintock felt she risked alienating the scientific mainstream, and from 1953 stopped publishing accounts of her research on controlling elements. The importance of McClintock's contributions was revealed in the 1960s, when the work of French geneticists Francois Jacob and Jacques Monod described the genetic regulation of the lac operon, a concept she had demonstrated with Ac/Ds in 1951. Following Jacob and Monod's 1961 Journal of Molecular Biology paper "Genetic regulatory mechanisms in the synthesis of proteins", McClintock wrote an article for American Naturalist comparing the lac operon and her work on controlling elements in maize. McClintock's contribution to biology is still not widely acknowledged as amounting to the discovery of genetic regulation. In 1947, McClintock received the Achievement Award from the American Association of University Women. She was elected a Fellow of the American Academy of Arts and Sciences in 1959. In 1967, McClintock was awarded the Kimber Genetics Award; three years later, she was given the National Medal of Science by Richard Nixon in 1970. She was the first woman to be awarded the National Medal of Science. Cold Spring Harbor named a building in her honor in 1973. She received the Louis and Bert Freedman Foundation Award and the Lewis S. Rosensteil Award in 1978. In 1981, she became the first recipient of the MacArthur Foundation Grant, and was awarded the Albert Lasker Award for Basic Medical Research, the Wolf Prize in Medicine and the Thomas Hunt Morgan Medal by the Genetics Society of America. In 1982, she was awarded the Louisa Gross Horwitz Prize from Columbia University for her research in the "evolution of genetic information and the control of its expression." Most notably, she received the Nobel Prize for Physiology or Medicine in 1983, the first woman to win that prize unshared, and the first American woman to win any unshared Nobel Prize. It was given to her by the Nobel Foundation for discovering "mobile genetic elements"; this was more than 30 years after she initially described the phenomenon of controlling elements. She was compared to Gregor Mendel in terms of her scientific career by the Swedish Academy of Sciences when she was awarded the Prize. She was elected a Foreign Member of the Royal Society (ForMemRS) in 1989. McClintock received the Benjamin Franklin Medal for Distinguished Achievement in the Sciences of the American Philosophical Society in 1993. She was awarded 14 Honorary Doctor of Science degrees and an Honorary Doctor of Humane Letters. In 1986 she was inducted into the National Women's Hall of Fame. During her final years, McClintock led a more public life, especially after Evelyn Fox Keller's 1983 biography of her, A Feeling for the Organism, brought McClintock's story to the public. She remained a regular presence in the Cold Spring Harbor community, and gave talks on mobile genetic elements and the history of genetics research for the benefit of junior scientists. An anthology of her 43 publications The Discovery and Characterization of Transposable Elements: The Collected Papers of Barbara McClintock was published in 1987. The McClintock Prize is named in her honour. Laureates of the award include David Baulcombe, Detlef Weigel Robert A. Martienssen, Jeffrey D. Palmer and Susan R. Wessler. Since her death, McClintock has been the subject of a biography by the science historian Nathaniel C. Comfort's The Tangled Field: Barbara McClintock's Search for the Patterns of Genetic Control. Comfort's biography contests some claims about McClintock, described as the "McClintock Myth", which he claims was perpetuated by the earlier biography by Keller. Keller's thesis was that McClintock was long ignored or met with derision because she was a woman working in the sciences. For example, when McClintock presented her findings that the genetics of maize did not conform to Mendelian distributions, geneticist Sewall Wright expressed the belief that she did not understand the underlying mathematics of her work, a belief he had expressed towards other women at the time. In addition, geneticist Lotte Auerbach recounted that Joshua Lederberg returned from a visit to McClintock's lab with the remark: 'By God, that woman is either crazy or a genius.' " As Auerbach tells it, McClintock had thrown Lederberg and his colleagues out after half an hour 'because of their arrogance. She was intolerant of arrogance ... She felt she had crossed a desert alone and no one had followed her.'" Comfort, however, asserts that McClintock was well regarded by her professional peers, even in the early years of her career. Although Comfort argues that McClintock was not a victim of gender discrimination, she has been widely written about in the context of women's studies. Most recent biographical works on women in science feature accounts of her experience. She is held up as a role model for girls in such works of children's literature as Edith Hope Fine's Barbara McClintock, Nobel Prize Geneticist, Deborah Heiligman's Barbara McClintock: Alone in Her Field and Mary Kittredge's Barbara McClintock. A recent biography for young adults by Naomi Pasachoff, Barbara McClintock, Genius of Genetics, provides a new perspective, based on the current literature. On May 4, 2005, the United States Postal Service issued the "American Scientists" commemorative postage stamp series, a set of four 37-cent self-adhesive stamps in several configurations. The scientists depicted were Barbara McClintock, John von Neumann, Josiah Willard Gibbs, and Richard Feynman. McClintock was also featured in a 1989 four-stamp issue from Sweden which illustrated the work of eight Nobel Prize-winning geneticists. A small building at Cornell University and a laboratory building at Cold Spring Harbor Laboratory were named for her. A street has been named after her in the new "Adlershof Development Society" science park in Berlin. Some of McClintock's personality and scientific achievements were referred to in Jeffrey Eugenides's 2011 novel The Marriage Plot, which tells the story of a yeast geneticist named Leonard who suffers from bipolar disorder. He works at a laboratory loosely based on Cold Spring Harbor. The character reminiscent of McClintock is a reclusive geneticist at the fictional laboratory, who makes the same discoveries as her factual counterpart. Judith Pratt wrote a play about McClintock, called MAIZE, which was read at Artemesia Theatre in Chicago in 2015, and will be produced in Ithaca NY—the home of Cornell University—in February–March 2018. ^ a b c d e f g Lamberts 2000. ^ a b c d e Comfort 2001, pp. 19–22. ^ Davison., Reynolds, Moira (1999). American women scientists : 23 inspiring biographies, 1900-2000. Jefferson, N.C.: McFarland. ISBN 978-0786406494. OCLC 40926627. ^ a b c d e f g Keller 1983. ^ a b Comfort 2001, pp. 23–27. ^ a b c d Kass 2003, pp. 1251–1260. ^ a b c The Barbara McClintock Papers – Cornell. ^ a b Kass & Bonneuil 2004, pp. 91–118. ^ Colonna, Federica Turriziani. "Barbara McClintock (1902–1992)". embryo.asu.edu. Retrieved November 27, 2014. ^ Fedoroff 1995, p. 217. ^ a b c d e f Fedoroff 1995, p. 212. ^ a b Coe & Kass 2005, pp. 6641–6656. ^ a b c Fedoroff 1995, p. 218. ^ a b c Fedoroff 1995, p. 219. ^ a b c d e CSHL Biography. ^ a b Kass 2005, p. 52–71. ^ a b Fedoroff 1995, p. 220. ^ a b c The Barbara McClintock Papers – Missouri. ^ a b Fedoroff 1995, p. 221. ^ Keller 1983, p. 114. ^ Comfort 2001, pp. 84–94. ^ a b c Comfort 1999, pp. 133–162. ^ a b c d Fedoroff 1995, p. 223. ^ Comfort 2001, pp. 102–115. ^ Klug et al. 2012, p. 395. ^ a b Pray & Zhaurova 2008. ^ a b Fedoroff 1995, p. 224. ^ Comfort 2001, pp. 209–217. ^ a b c Kolata 1992. ^ McClintock 1961, pp. 265–277. ^ a b Fedoroff 1995, p. 213. ^ a b Fedoroff 1995, p. 229. ^ "The President's National Medal of Science: Recipient Detailswork=National Science Foundation". Archived from the original on September 11, 2015. ^ a b c Washington Post. ^ "Barbara McClintock". Nasonline.org. 2018-03-30. Retrieved 2018-08-19. ^ a b "The McClintock Prize for Plant Genetics and Genome Studies". www.maizegdb.org. Fedoroff, N. V. (1994). "Barbara McClintock. 16 June 1902-2 September 1992". Biographical Memoirs of Fellows of the Royal Society. 40 (1): 1–10. doi:10.1098/rsbm.1994.0039. PMC 1205761. PMID 8138147. Wikimedia Commons has media related to Barbara McClintock.